This exercise will help you practice distinguishing between an event and a pattern over time. 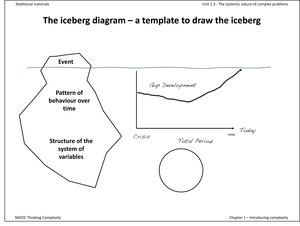 It involves drawing an iceberg diagram to distinguish between an event at a point in time and a pattern of behaviour over time. This online news article is about the growing gap between the rich and the poor in OECD countries. Your task is to draw an iceberg diagram with the event and the pattern of behavior of the main variable over time. You don't need to draw the systemic structure. Hint: You can use the iceberg template that is available in the additional materials. A suggested solution is provided in the references section. It seems to me however,that according to the article, the gap is more or less straightforward rising with only a very light slowdown during the mentioned crisis period.